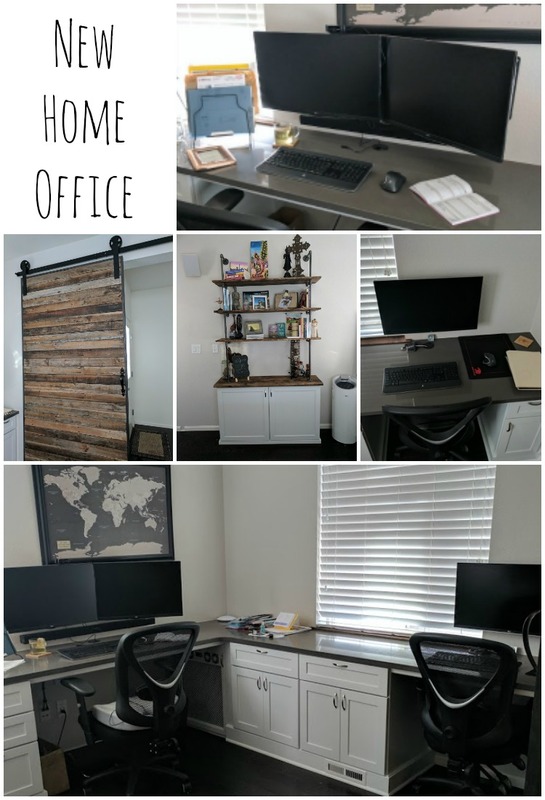 My husband recently remodeled our home office. During the process we decided we wanted to get a sound system installed like we have throughout the rest of the house. Wiring into the existing system seemed to be way more costly than necessary so we started looking at wireless options. The first thing we tried was a bluetooth transmitter and receiver setup. What a pain! The audio quality wasn’t very good and the connection kept dropping out and was unreliable. So we went back to the drawing board. Enter Google’s Chromecast Audio. We had heard of Google’s Chromecast before but not the Google Chromecast Audio. 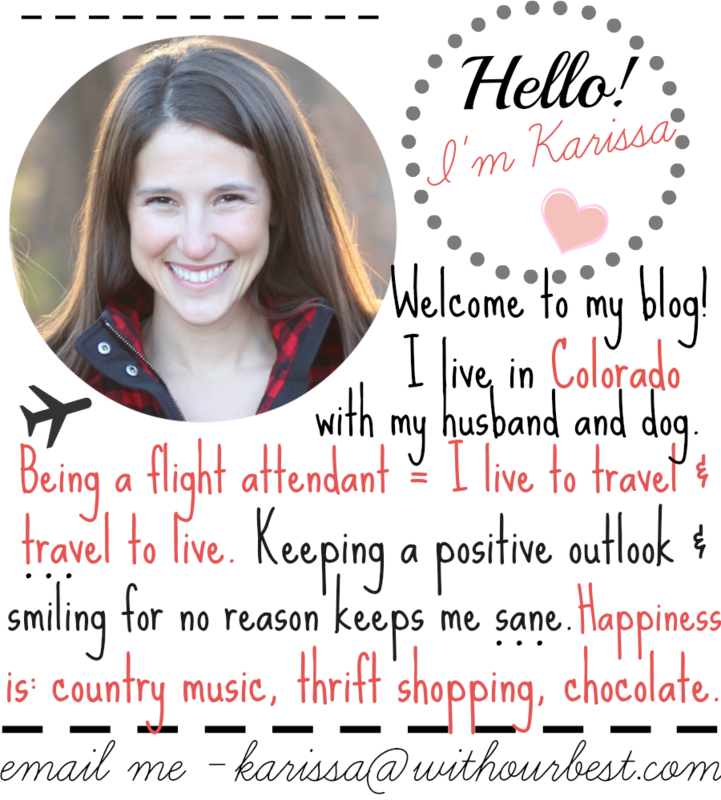 After looking into the simplicity (and low cost!) of the devices it became clear that this could be the solution we were looking for. After setting them up and getting things up and running (easy) it turns out it was!! The Chromecast Audio is a nifty little device that you power using a standard micro-USB power cord and then plug into whatever speaker, receiver, stereo, or amplifier you have in your home. The device is *really* easy to setup thanks to the Google Home App (Android or iOS) and we had them up in running in minutes. We ended up with two devices, one for the stereo in the living room and another for the new amplifier in the office. Once they were both connected to our home’s WIFI system, we were able to easily create a Group for the whole house and start casting to both speaker systems!! So unbelievably cool! 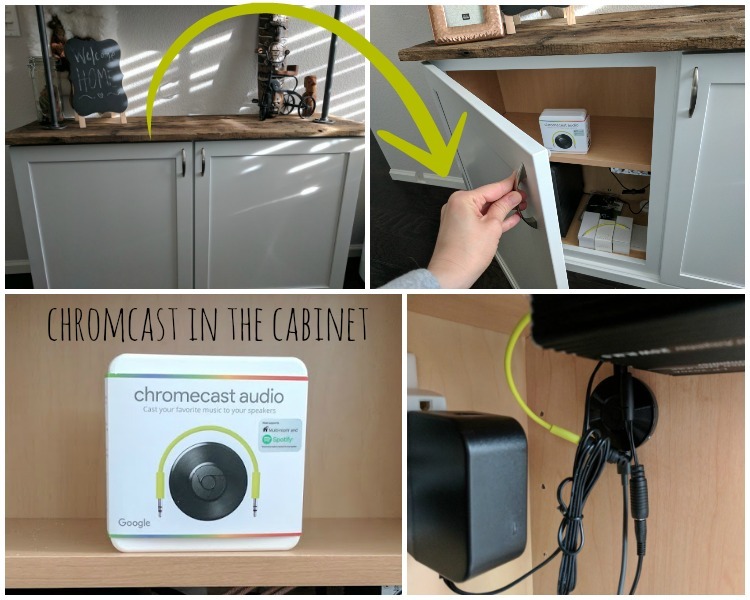 Google’s Chromecast Audio has a number of different ways you can connect to your existing system. We’ve got the optical cable in the living room and a standard auxiliary jack in the office. Both sound amazing but you KNOW you’re getting great sound out of the optical connection to our home’s main sound system. I love the fact that the Chromecast Audio doesn’t mess with the audio quality in the way that Bluetooth did. Things sound great!! Not to get too techy but we did at first notice a little bit of a delay between the two systems but this was easily corrected using the Google Home app which lets you offset the audio signals to keep any annoying echos out… super slick. 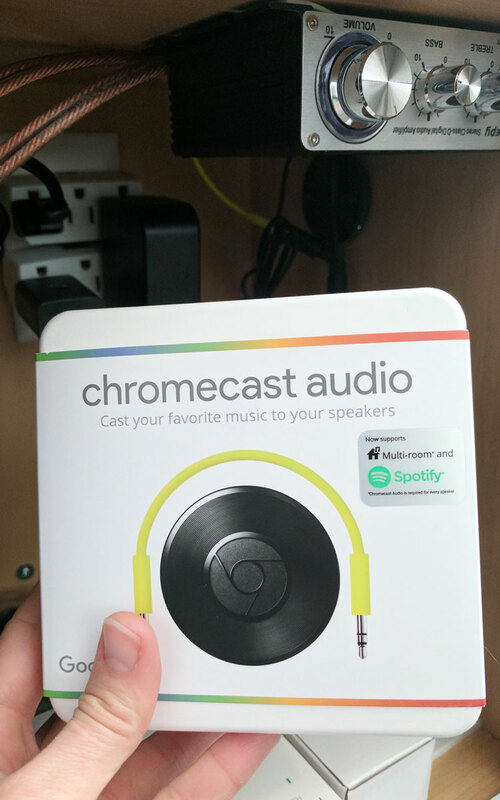 It seems like everything supports Chromecast Audio these days! We’ve got the ability to stream music from Spotify, Pandora, iHeartRadio, and YouTube super easily from our laptops, iPads, and Pixel phones. Audio keeps playing even if I make a call with my phone (which was an issue with Bluetooth)! I love that I can start playing a song from my laptop over the whole house and then pause or skip songs using my Pixel later. Incredibly handy. Of course, we know now that we have a winner on our hands with the Google Chromecast Audio. If we ever decide to add more speakers to other rooms or even outside (and knowing my husband, I’m sure we will!) we will definitely pick up another Chromecast Audio and add it in without hesitation. I’m going to be getting on of these this weekend. I love to work when my jams are blasting and I’ve got some sweet speakers just dying to stream my tunes. I have only heard good things about Google Chromecast. I would definitely make good use of this in my living room! I keep hearing so many good things about this. I hope I can get my hands on one soon! This would be great to use in our home. I like that it doesn’t drop the songs when you make a call. I have hears really good thing sabot the Google Chromecast! Great post! I have been wondering how this works and how people are liking it! Thanks for sharing some info about it! We love our chromecast and our super fast internet. This would be a perfect addition to use to stream music. My husband has a huge sound system built into our bedroom television set up. This might be much easier for us to do. This looks like such a great way to put music in the house. 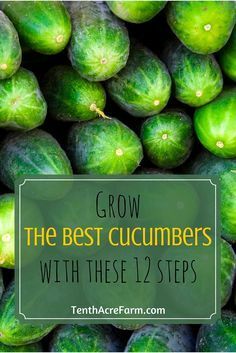 I will have to have my husband check this out! I love my Spotify Premium I will have to try this! I need my music in every room that’s for sure! This sounds amazing! I could listen to Spotify in every room of the house without having to drag my computer around with me.